James Brown’s funky diva Martha High has joined forces with Japan’s heavy funk crew Osaka Monaurail to create some seriously funky music on record and on stage. For over 30 years Martha Harvin, better known by her stage name Martha High, stood 10 feet from stardom as one of the backing singers for the Godfather of Soul James Brown. She was one of the longest serving members of Brown’s various backing bands – only Brown’s personnal MC Danny Ray probably lasted longer. High performed on many of Brown’s notable funky hits, and performed with him around the world, including at the legendary 1974 performance in Zaire before the “Rumble in the Jungle” fight between Muhammed Ali and George Foreman. While other musicians came and went, High survived over three decades with Soul Brother Number One, no mean feat considering Brown’s famous volanic temper. But Brown clearly enjoyed having High around, and from her recent performance at London’s excellent Under The Bridge it’s easy to understand why Brown kept her around for so long. High is a great singer who possesses a soulful voice in the same category as Sharon Jones. She’s also an incredible performer who defies her age, as well as being a funny, gracious lady. Backing High on her latest album and tour are the ambassadors of Japenese funk Osaka Monaurail, a group very much in the mould of James Brown’s backing bands. 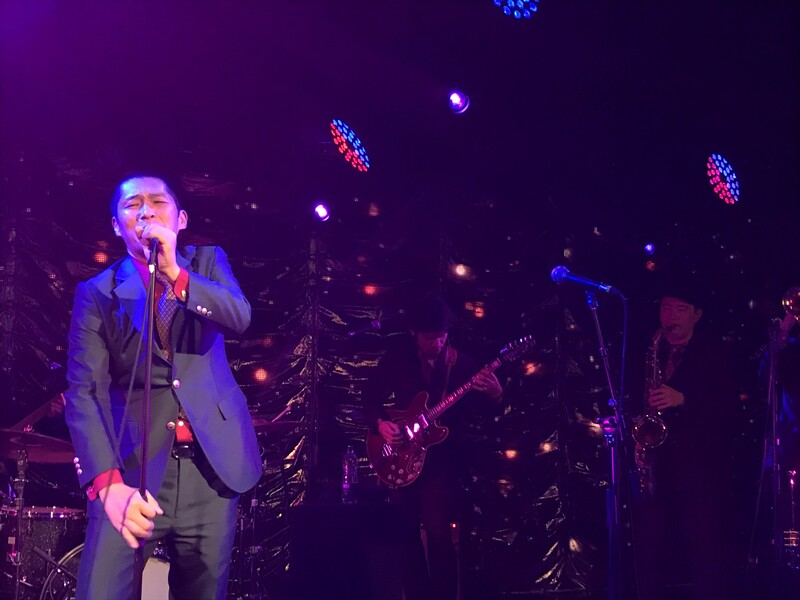 The group, featuring a drummer, bassist, two guitarists, two singers (including the group’s leader Ryo Nakata, Japan’s answer to James Brown), and three horns, cut an impressive figure on the small stage. The musicians were decked out in stylish double-breasted burgendy suits, and they hit the groove almost instantly, providing a masterclass in late sixities/seventies funk. The group has been together for 25 years, and over that time have performed with many of James Brown’s funky crew. The group clearly emulate the J.B’s era of Brown’s backing bands, but they’ve become funk masters in their own right, and their reputation as excellent performers was confirmed at Under the Bridge. Ryo Nakata leading Osaka Monaurail. The group took to the stage first, performing a musicial introduction to set the groove for the rest of the night. Then leader Ryo Nakata bounced onto the stage, grabbing the microphone ferociously, dancing and singing as if he was JB himself. Osaka Monauraill played for about 15 minutes without High, warming the crowd up with their delicious funk grooves, including the excellent ‘Fruit Basket‘, a song that seemed to go on and on and on, but one that I would have happily have heard more of. It was then time for High to grace the stage, dressed all in black looking every part of the funky diva that she is. She opened her performance with a roaring version of Lyn Collins’ ‘Think (About It)‘, an absolute joy of a funk gem that High did justice too, as well as putting her own spin on (her voice is ever so slightly softer than Collins’ deeper, gruffer vocals). Incredibly, High and Osaka Monaurail would perform for nearly two hours in total, but only peroformed a handful of songs. We did get an extended medley of songs sung almost acapella by High, honouring the other funky divas who performed with James Brown. High sung a song she had originally done with a group called The Jewels (the poignant ‘This Is My Story‘) who opened for James Brown in the sixties, she then did a snippets of ‘Mama’s Got a Bag of Her Own‘, ‘Mama Feelgood‘ and ‘I Cried‘. The medley was very impressive, showcasing High’s versality and showing that she was more than just a backing singer: she’s a great artist in her own right. These songs were taken from her new album with Osaka Monaurail, the excellent Tribute to My Soul Sisters. High talked about her time with James Brown, and his desire to record his female singers as a chance to showcase their talents, but also to show that women were just as strong and powerful as men. Certainly, some of the songs were powerful – particularly ‘Think (About It)’ and ‘Mama’s Got a Bag of Her Own’ (a reply song to Brown’s funk epic ‘Papa’s Got A Brand New Bag‘). Yet for High’s words of praise for Brown, who was undoubtedly a musical genius who transformed popular music, he wasn’t that respectful of women in his personal life: allegations of domestic violence and abuse followed him for decades, including one grim story of domestic and sexual abuse Tammi Montgomery (who would go onto to become a Motown star as Tammi Terrell). Anyway, history lesson over, back to the show. High then took nearly half an hour to perform two songs from her 1979 solo, self-titled debut album. Originally released on SalSoul Records, James Brown produced the record, delivering a record that straddled funk, soul and disco, resulting in an album far superior to anything he was putting out at the same time under his own name. High’s album suggests that Brown hadn’t lost his magic touch, he just wasn’t applying it right. High first performed ‘Showdown‘, a dance-orientated number with a beat held steady by Osaka Monaurail. High was particularly impressive on this number, and she sounded terrific, cutting an impressive figure on Under The Bridge’s small but intimate stage. She then instigated a dance competition, splitting the crowd down the middle as if we were on an episode of Soul Train, inviting dancers parade up and down the clearing (safe to say that we avoided being seen dancing badly). The SalSoul groove continued with a rendition of ‘Ding Dong Man‘, a song clearly ripping off the classic disco cheese ‘Ring My Bell’ by Anita Ward. Osaka Monaurail even slided into ‘Ring My Bell‘ at one point, with High leading a call-and-response with the audience. High joked that “Mr Brown” as she still calls the Godfather “must have liked that song” and “borrowed part of it”. As the set entered the two hour zone, High introduced each of the musicians in Osaka Monaurail, allowing each to have a little solo and a round of applause from the highly appreciative crowd. The curfew neared, but High and Osaka Monaurail had time for one more song, a blistering rendition of Lyn Collins’ ‘Rock Me Again & Again & Again’, one of the finest in the James Brown arsenal of hits. High was outstanding as she had been all night, as was Osaka Monaurail, cranking the funk up yet another notch for the show’s climax. Two hours later, the funk was over. But what an incredible two hours it had been: High had been so impressive and so brilliant, as had Osaka Monaurail, who had brought the funk to London in truckloads. The pairing of the two together was a funk dream: they both clearly love playing with each other, and the music they’ve created on record and stage is a testament to their skill and talent. The band and High were even gracious enough to stick around after the show, signing their new album and posing for photos (naturally I bought a record and had a photo). It was quite simply an evening of pure, funky joy.